From the beloved bestselling creator of The Dot and our own Happy Dreamer comes an inspiring story about the transformative and profound power of words. Some people collect stamps. Some people collect coins. Some people collect art. And Jerome? Jerome collected words . . . 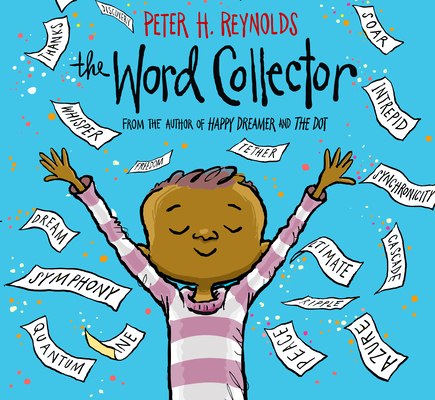 In this extraordinary new tale from Peter H. Reynolds, Jerome discovers the magic of the words all around him -- short and sweet words, two-syllable treats, and multisyllable words that sound like little songs. Words that connect, transform, and empower. From the creator of The Dot, I Am Human, and Happy Dreamer comes a celebration of finding your own words -- and the impact you can have when you share them with the world. Peter H. Reynolds is a New York Times bestselling author and illustrator of many books for children, including The Dot, Ish, I Am Human, Happy Dreamer, The Word Collector, and his forthcoming picture book, Say Something!. His books have been translated into over 25 languages around the globe and are celebrated worldwide. In 1996, he founded FableVision with his brother, Paul, as a social change agency to help create "stories that matter, stories that move." He lives in Dedham, Massachusetts, with his family. Visit him online at peterhreynolds.com.